The Dharma Initiative Volunteer Assessment Test consists of a series of questions designed to provoke an emotional response. The following test will assess your suitability for the Dharma Initiative’s Volunteer Recruitment Program. This is a multiple-choice test of 17 questions.The test will take approximately five (5) minutes to complete. Instructions: Choose the answer that you most associate with the following images. Instructions: Choose the answer that you think is most likely in the following hypothetical situations. A spider is biting your arm. You don't kill it. Why? You just stole a sick child's toy. Why? A tortoise is on its back in the sun. You're not helping. Why? You are crawling across a stormy beach. Why? You are running down an unfamiliar street. why? You are lying face down on the edge of a cemetery. Why? You're sitting on your bed with a sharp knife. Why? Those who come to the Dharma Initiative will have to travel a long way across the sea at a considerable speed. Work will include being outdoors and physical labor. You may also experience some [instability of time along the way]. Hopefully you, like many others, feel that your social duty is more important than your personal safety. *Thanks to Lost2010 in comments for pointing this out. It seems something dutch, for me! But I'm not sure, I study German and French and I speakt Italian. IMHO, it's none of these ones. But I think I can grasp something familiar. I'm also quite sure to hear "Dharma" a couple of times. Now I'll try to ask a dutch friend of mine. I think it could be Dutch also for another reason: Hans van Eeghen is surely a Dutch name. I've passed the test ! I'm now registered, but have had two problems when doing so. 1. The email address I tried to use was rejected, I found out that it will not accept second level domains e.g. fred@fred.co.uk is invalid but fred@fred.com is fine. 2. I can't upload a picture, has anyone managed to do this ? If so what file format did you use ? Yeah, also a friend of mine had a problem with her yahoo e-mail address, so she used another e-mail. About the picture, I've uploaded a Jpeg taken with my webcam, so maybe it's a problem of dimension in KB, I don't know. The thing about the Black Swan is really really tasty! I think we should get further on that road. Simone - Yes it was the aspect ratio of the picture that was the problem. I resized the picture so it was tall and narrow and it worked fine. I think this looks like we will get sent a Dharma Initiative member card with our details and picture on it. I wrote in a previous post that the pin hole that the message came through might have been opened at the same time as 815 crashing, but having now listened to the TLC podcast I am thinking that it was opened when the sky went purple at the end of series 2. Great! I would love a DI card!!! After the test, I registered on the Dharma website, putting my name, password and date of birth. The strange thing, that I noticed only when it was too late, was that the default date wasn't so "default": normally, when you register on other websites, the default birthdate is kinda 1st January 1900 or some other year. But in this case it was the 17th of a-month-I-don't-remember of 1978. I wonder if the date could be a clue (if "time is the essence"...). So, if there are new recruits, could you please check what the month was? I'm quite sure of the day and year before I changed them with my personal data. BTW, my dutch colleague (I'm kind in the office at "work" right now... LOL!) has already gone out, so I won't figure out if the voice on DWY speaks dutch till tomorrow. Simone - Be prepared for a rollercoaster ride, if it is anything like the first one. That would be the 30 year period since the video was sent, so could it be the date the video was sent ? I've had a quick check and I can't find anything obvious that happened on that day in history, in fact it is fairly bereft of any events. The most interesting thing I found was that ABBA were 34th in the Dutch charts on that day with Thankyou for the Music. I'd vote for 7/17/78 being on or about the date of the Purge. But it could be something as basic as the programmer's birthdate. And as usual, I have not yet received an email from Hans. Did you get it Maven? If the normal email protocol is at work, I should get it before noon CDT today. Didn't we look into Black Swan's a bit back in Season 3 when Jack was being held by the Others. I think it came up from the cartoon Jack is made to watch which is The Blue Danube section of A Corny Concerto. I have to say the Wiki page on Black Swan Theory pretty much tells us we're wasting our time trying to predict based on the unusual or explain in hindsight. So should we stop? That conclusion makes sense for TPTB to tell us, but not so much Ruckus Guy. While I was typing the previous post, Hans finally emailed me. Morning gang. Summer vacation and I got up at 6:30am to catch up LOL @ myself! Anyway, this is mainly for e-mail comments. Last night I did find it odd that in the test, the image of the warped carrot had "amputate" as a choice of association. I picked amputate, because when I look at that thing all I see is a foot shaped carrot. But what does seeing amputated feet in a carrot say about my "talents and abilities"? I said amputate too Ange. That was the grossest picture of the lot. I wonder when DWY will update it's assessment info. It hasn't done it yet. I hope it will not be at 10:20 pm CDT again. Has anyone seen a person who had taken the test at the Dharma booth reporting in on what they got when they clicked that button? Well, when we signed up you could opt for e-mail and SMS reminders. I wonder if we won't have to rely on a time so much as they'll just text/e-mail us when it's time to go show our skills. Although that just stinks for those who don't get the mails in a timely manor! I'm scanning the blogs Memphish and no Comic Con recruit reports yet. Did we all end up saying amputate? That's almost funny. So, it seems like this weeks hacks are just catching us late-comers up to what the comic-con attendees got at comic-con. Does that seem about right so far? I sent a message to 2 people on Twitter who took the test at ComicCon. I'll see what they get back to me. Great!! I am getting the dreaded, error too many connections message!! I better be able to do this before I go to work! Sounds like fun guys, wish I could help today, I am going to be on tomorrow all day until 2pm, then I am going to go see O.A.R. at the festival pier in Philly. I just had my Van Eeghen email arrive about 30 minutes ago. Ugh!! No time to register, must do it tomorrow!! Off to work! Thanks Lost2010 for posting about that, I just added it to the main page. So do you think the "winners" will get a real prize like getting to be a log carrying guy or a Locke Other -- Lother? Were there prizes before? Perhaps you get to be one of the "purged" in the next flashback of that era. There weren't prizes before I don't think, but then we didn't have to fill out detailed info. and sign waivers before either. And before we were acting covertly. We weren't working with the DI. In the icelandic translation, I think it's interesting that we will experience some "instability of time" along the way. If it weren't lost related, I'd read that as jet lag. I wonder if that's why the game got such a late start - we're already experiencing that 'instability of time'. Just got my Hans email. Haven't been able to get onto DWY. Frist of all, thanks everyone for working so hard while I was asleep! :-D And especially to Dennis/Admins for laying all this out so perfectly on the front page. The other main blogs covering it make you do too much clicking around to get to the meat, IMHO, and this layout is great. Way to go Memphish, on remembering the Blue Danube swan cartoon (one of my all time favorites)! I think that it goes without saying (but I'll say it anyway, hahah) that the first part of the Wiki black swan def says it all: "...large-impact, hard-to-predict, and rare event beyond the realm of normal expectations." Purge anyone? I didn't say 'amputate', I said 'metamorphose' because the carrot looked mutated. I'm dumb. Way to go with the great ideas everyone! LOL Lost2010 (instability of time)! I'm like you I can't keep up with the post either. I scrolled right past the comments on this one this morning. I don't know why I didn't suggest you check the source code last night. That's the first thing I always do. I think I was to sleepy to think. I went to bed right after that. When I checked my email this morning it was another hour before I got my email. 2:00 am!! Back up to read the post. I have to say I went for the Eat option on the carrot picture. When you have grown your own carrots you realise they come out in all shapes and sizes. This black swan theory is fascinating and makes we want to learn more about the philosophy. Something that I find odd though is this sentence:"His claim is that almost all consequential events in history come from the unexpected—while humans convince themselves that these events are explainable in hindsight (bias)." This works well with the purge and what Cheng asked us and all, etc., although it doesn't really fit into the original purpose of the DI, which was to act on a dire prediction (the VE) and to solve and avoid it. Hmmmmm. Hello All! This is my first time posting here but I've been reading along the past two days and love all the comments! This is my first time doing one of these ARGs (I watched my husband do the last one). I'm trying to register but it's stuck loading (not the web browser but the actual DWY page - Dharma logo with 'loading'). It's been this way for a good 10 minutes. Has anyone else experienced this? That Icelandic translation sounds like we might have to drink the kool-aid like Juliet did! :-o Sure, for a job with no pay I am ready, willing, and able, to risk my life in any danger, heheh. Welcome to the LoCo/TLC fun Laura! I'm sure DWY is overloaded for now. Everyone is catching up from last night. Did you guys plug your snail-mail address in? I declined to, since I figured that ABC would sell our names to junk mail companies. But if you all took the plunge, I'll change my profile later to add it. So hacking the source code in someone's email -- how would you do that? Does it imply that they are in the same place, same server, or nothing at all? I think I'm registered. I put in all of my info (including snail mail, capcom) and even though it loaded and loaded, it finally went through. I've been able to log out and back in, although when I do go in, nothing shows up in my profile. When I tried to add my info in again, it suddenly popped up. I think it's just buggy, so I'm going to let it be for now. Does anyone know - is it possible to NOT pass the test? Or do you pass no matter what you answer? Welcome to all the new posters here great to have you aboard!! I've growned carrots to and they do come out odd looking sometimes. But when I seen the first blurry version of the video my first thought was a 4 toed foot so I went with amputated. They had to know some people would go there or it wouldn't have been an option. On some of the pictures I wouldn't have chosen any of the options but I had to pick something. I seen the people over at ITE talking about origami but didn't know where they got it. Now I do thanks. Capcom - I did add my home address, but it will probably cost ABC more money to send it to the UK that it is worth. Mind you they might sell it on to someone in the UK. If a web form in the UK asks for address details it has to have a box to tick to say that you do not want to receive marketing info. andrea - mine loaded forever, so I would just let it go. Even when the Dharma voice started talking again, thanking me for registering, the screen was STILL loading. Mine took at least 10 minutes. capcom - did you see The X-Files yet? I passed the test (I said metamorphosis for the carrot) and have been waiting for my registration to load for 20 minutes so far. I put in all of my info. I'm ready to risk serious spam to ensure that I don't miss a thing from DI. I put in my snail mail. I can't get anymore junk mail than I already do. I didn't upload a picture though. Morning all on a busy ARG morning (feels so great to say that)! As usual, great summary in the posts, Dennis! Thanks over and over again! I still haven't gotten my email (I was always the last to get one). Oh, well. I did put in my snail mail info. But every time I go into my profile, I have to re-enter my password 3 times. Also, I did have trouble loading a pic I wanted (with Elizabeth) and it was under 2MB. Maybe the shape was the problem. I, too, am having trouble loading and getting into DWY. I also got the error page (shown at Dark's) for the main site. I guess they are overloaded this morning! In Nassim Nicholas Taleb's definition, a black swan is a large-impact, hard-to-predict, and rare event beyond the realm of normal expectations. Taleb regards many scientific discoveries as black swans—"undirected" and unpredicted. He gives the rise of the Internet, the personal computer, the first world war, as well as the September 11, 2001 attacks as examples of Black Swan events. I guess we're in for the unexpected. Laura - not sure but I think someone checked the source code on the e-mail and found an anagram for Black Swan up thread. Laura: In the latest email source code there was anagram clue (Banks Claw) which become Black Swan. There were also the swan origamis on the Dharma handouts at Comic Con. Good morning! I stayed up way too late last night, but I was having too much fun. I'm glad we got the translation. I feel I'm already experiencing some instability of time. First, I get the e-mail to register AFTER I already registered. Second, in the last post (the one with only 7 comments) I put a link to the wiki on the Black Swan Theory and then some anonymous writes "Black Swan Theory check wikipedia". which I found while reading about the Black Swan Theory. Counterfactual history "seeks to explore history and historical incidents by means of extrapolating a timeline in which certain key historical events did not happen or had an outcome which was different from that which did in fact occur." I'm wondering if this is what the DI wants to do; to find a key historical event and change it by using their time-travel abilities? mavin- I missed that! Very cool! My registration didn't load after an hour and a half. I canceled it and will try again later. I'll probably have to take the test again. The DWY site must be really busy today... I couldn't reload my profile today. It just kept saying loading, loading, loading.. Sorry I haven't been able to reply. I've been busy going to places that Dan Bronson may have been before me. The little information that I give in each post is very hard for me and I wish I could tell you more about what I know. I knew about Dan Bronson two days before he made himself visible to the world because of a Halloween party I had met him at. He wore a BumbleBee costume. I guess. Someone at another blog mentioned it's BumbleBee with two capital B's and that means the transformer... where's Thrasher? PseuMdoYnym at lostpedia forums said..
"Are you saying BumbleBee is like RuckusGuy? Cause, BumbleBee is the big yellow VW bug (in the show) or pontiac (in the movie). I'm not sure how they relate, except that BumbleBee communicates via radio? Maybe it's a clue to where/what the next contact from RuckusGuy will be?" I didn't even know there was a Bumble Bee transformer. Maybe they're just saying BumbleBee is his other alias - didn't they say something about him having 2 aliases. . .
On wiki, it says his 'function' is espionage. His motto - 'The least likely can be the most dangerous'. Could be Zort, I used to work with someone who worked on some software that enabled gathering/elling information like that to advertisers, etc. You can really make a lot of money doing that, which really blows. I want to make money off of my own info, dammitt! Yes, I saw The Files ML, the first day! I thought about going at midnight on Thursday, but decided against going by myself that late at night in "Knox Vegas". Did you see it yet? I like that Codysmom, about them maybe trying to actually cause a high-impact event. It's probably unrelated, but maybe capcom's nephew will like it. You beat me to it, lost 2010! codysmom - great minds. .
New Post! It's "buzzing" with information ;). It's the cover of Blind Melon's self-titled album. Here's the No Rain Video. Hey, Bee Girl! X-D OK, now I've got that stupid song on my head. That costume at Comic Con is great! Ian will love to see that, thanks! Hi everyone. Great post, Dennis! I was reading a bit about BumbleBee on wikipedia. There was a G.B. Blackrock in the comicbook version. "Bumblebee arranged their first meeting with Optimus Prime, and his role as a "liaison" of sorts between the Autobots and humans continued as he participated in the first meetings with millionaire industrialist G. B. Blackrock, eventually leading to a deal between them that saw Blackrock supply the robots with fuel." 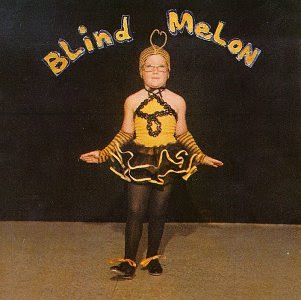 Personally, I was rooting for the Blind Melon bee girl. But it must be a Transformers reference. I was in DWY last night at 11:15 EST without a problem but I have not been able to get back in since then. I didn't get to take the test at Comic-Con, to bad, because I nailed it online!